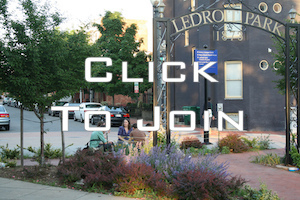 ____Our community dog park is located in the Park at LeDroit (300 block of V St., NW). The park is managed by the Bloomingdale LeDroit Dog Park Association (BLDPA). BLDPA is an all-volunteer, non-profit organization partnered with the DC Department of Parks and Recreation (DPR) – through a legally executed Memorandum of Understanding – to provide custodial care of the dog park in the Park at LeDroit. For more information about using the dog park, visit BLDPA’s website at www.bldpa.org or send them an email at bldpadogs@gmail.com. Always keep your dog on a leash (unless inside the dog park) – its the LAW!! Pick up and properly dispose of your dog’s waste – dog waste is a serious hazard to our local waterways. Keep your dog off of peoples’ front lawns. Do not throw your pet waste in a home’s garbage can – please wait until you get home or throw it in a public receptacle.